Or, instead of silica crystals, use salt. OR, dried rice soaks up moisture. Yes that's what I think! Its like a Hoodlum mythbusters! Thought I would try to see how homemade containers stack up to store bought ones. 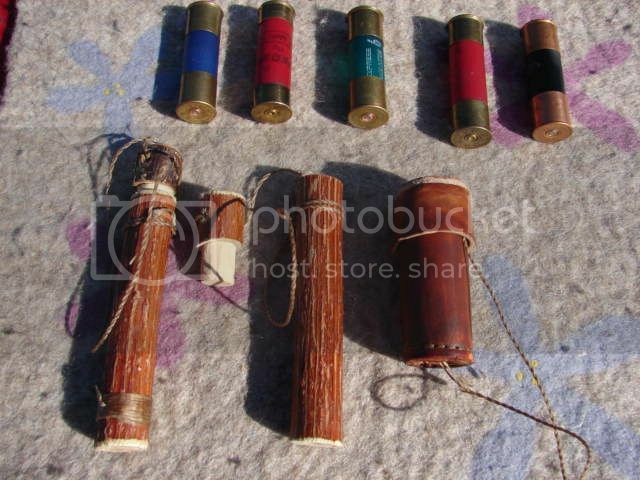 I have some classic shotgun shell ones, Elderberry and a leather one. Thought I would stick the bag in the tree this coming week but will be adding things now and then. I have a few of the old aluminum screw top 35mm film cans. That would great Steve. They would be good to try different desiccants (rice, salt, silica). I always carry a tube of vitamin C + minerals tablets. In the cap of the tube there is a tablet, which I assume takes up the moisture. Well, although the container is rather long, it would work well as a container for matches. Or, cut a tube in half and emery paper the sawn half down smooth to take the cap. It might not be a good seal, but just superglue around under the cap maybe. I have some candy tubes that look like them. But the tablet in the lid sounds interesting. Being to long doesn't matter, I can just fill the space with some cotton balls or something. Need to stick some matches in some petroleum jelly to see how messed up they'll be. I need to pull out the food sealer and seal some up. I've done that on things for some white water trips, but it was only for a couple days to a week. Had a good snow today. Good time to stick the bag in the tree. Remember this: If you coat only the heads of the matches, dampness can migrate through the wooden "stick" portion of the match and wet the head from the inside out. For a home-made desiccant, take some scraps of sheetrock (drywall/wallboard), cut them into an appropriate size, bake them in the oven for an hour at 350 degrees, and drop them into your watertight container. (Baking drives off the moisture, and the sheetrock acts to absorb the moisture from the enclosed space). This works particularly well if you're storing boxes of ammunition in steel GI ammo cans. Also note that with any of these airtight containers, the real secret is keeping them out of direct sunlight and insulating them from heat. If you don't, you create a little mini ecosystem where the heat/light creates condensation within the enclosed environment--a greenhouse effect, and we all know how humid it is in a greenhouse. Packing the materials on a hot, dry day helps as well. Lot of good information. I have some cat litter that's 100% silica gel. Going to bake it first. Think I'll put some steel wool in a few containers and see how it fares. I'm thinking of leaving them out until March or April, maybe May. Another container for matches . . .
Maybe it would help cling filming the box after it is filled. Did a few for Motman241 today. Ziplocs in a few different ways. Some of the vitamin container lids seem better than the medicine container lids. 900 matches in 50 containers hung on the north side of a south facing ponderosa pine. Nothing fancy just a few containers I had laying around. Should give us an idea of what works or doesn't. Was going to use a spruce but I wanted more exposure. Will post pics and inventory when I get on a real keyboard. Worse thing about this is when I pull it down we'll be on Facebook. Time to start phase 2. The 30 day challenge. 30 matches in each group, each group with a different coating plus some store bought storm matches left outside. Each day I light a match from each group until I get one to light then go to the next group. Groups that makes the most days wins. Coatings for this challenge will be wax, turpentine, Thompson's water seal, nail polish, must be forgetting something. Any ideas?? ?